TheBigChuckbowski wrote: Sounds like there have been discussions with a local Sundry-like business for the retail space on 31st. When Mac Properties first announced their plans for the office building conversion at 301 E Armour, they seemed to mention this same business as a possible tenant for one of the retail spaces. Perhaps their negotiations didn't work out. TheBigChuckbowski wrote: If they can't get approval on the parking issue, she would likely just renovate the Velvet Freeze building and put surface parking where the new building is planned but she definitely did not want to do that. What approval do they need? Is this a city code issue that would need a variance, or do they need approval from the neighborhood? KCtoBrooklyn wrote: What approval do they need? Is this a city code issue that would need a variance, or do they need approval from the neighborhood? So, I wasn't totally clear on that as the parking discussion kept going off on little tangents. The parking definitely does not meet current city code so I believe they're looking to get neighborhood support which should make getting a variance easier. She also mentioned that people had told her that the GDAP, which doesn't require parking, could envelope this area in a year and a half and at that point, there would be no parking requirements. The owner of the property, I can't remember her name. She says she's a Hyde Park resident that has an accounting firm downtown and this is her first foray into development. In my perfect world, a developer would purchase the entire block and redevelop the west side with a parking garage that creates structured parking for Battery Lofts and the Velvet Freeze project with apartments on top. This would create an uninterrupted street wall along the east side of Gillham. 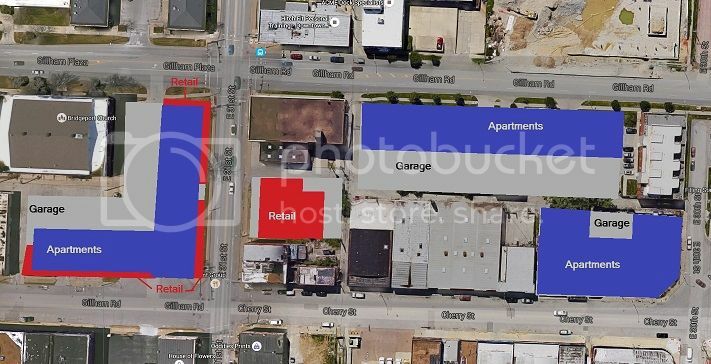 The garage would also provide parking for new retail on the vacant lot fronting 31st Street, the Velvet Freeze retail space, and the renovated retail spaces on the west side of Cherry. The SW corner of 30th and Cherry would get underground parking and apartments on top. South of 31st Street, the same developer, or another one, could buy the El Torreon Ballroom (Bridgeport Church), and the vacant lot to the east of the ballroom fronting Cherry. Then take that lot and the surface lot in front of the ballroom and create underground parking. On top put retail spaces, and apartments. A open-air pedestrian alley would be created in front of the El Torreon Ballroom. Patrons could access the garage via the pedestrian alley. It would be well-lighted, and signage for the ballroom would hang over the alley entrance facing Gillham. That's not bad. The hidden parking is a good idea. Scale the garage up enough and it could be used for retail store employee parking too, allowing this to go denser in the area. I think if done right, Cherry could become a nice little retail corridor between 30th Street and Linwood. Take out the cash advance building and the car wash on Linwood, and replace them with two smaller apartment buildings. The building to the immediate north of this project (south of Battery Lofts)is an atrocious urban slap in the face. It is a light industrial/warehouse type structure. It has a larger back portion and then next to the street is what was clearly a showroom, probably with glass on three sides. The whole thing has been bricked over at some time(these newer bricks are in worse shape than the rest of the building). The irony is that it is an art restoration business. The Denver development firm that bought the old Kansas City Club last year now plans to renovate a historic structure near the Martini Corner entertainment district. Epoch Developments, led by developer Craig Slawson, has retained El Dorado Inc. to design a mixed-use project incorporating the old Velvet Freeze/Levy Building at 31st Street and Gillham Road and 83,000 square feet of adjacent new construction. Called 31 Levy, the project will include 122 studio through two-bedroom apartment units and 7,000 to 8,000 square feet of commercial space. That location could be the centerpoint gathering place for the neighborhood but it needs to be structured as many smaller retail spots rather than a couple large ones. IE they have a coffee shop down the street but in a stand alone building that isolates itself from pedestrian continuity. Ideally there would be coffee shop, next to a small bookstore, next to a small market/liquor store, next to a counter baker, next to a counter deli, next to a barber/stylist, next to a pizza counter, etc. That location ideally should be structured for something like this. I'm sympathetic to the design for a couple reasons. 1. As described in a neighborhood meeting, the rendering is not showing their true plan for the ground-level wall which will be much more of a green wall than a few ivys like pictured. 2. They're not seeking incentives, doing the parking another way would significantly increase the cost and either require incentives or prevent the building from being built in the first place. 3. The parking is kept to a minimum with really only something like .6 spots per unit. That's fantastic for KC. 4. 31st already has an absolute ton of retail spots already that are being underutilized, not to mention all the retail coming online across the street in the new buildings on Gillham that have only filled one spot so far. Across the intersection the newer freestanding retail buildings with dedicated parking lot have been vacant for years. Must be wanting outrageous rents. Those spaces are too large. They need to reconstruct into much smaller long narrow spaces (allowing lower rents) and target small neighborhood amenities. You know, like real cities, not suburban stripmalls. A larger space has value though. You can get a CVS or such to go into one of them. Or an Urban RD4L and so on. They really don't need to be adding much new retail space in that neighborhood anyway. There are plenty of older former retail buildings all around that block that just need to be remodeled. FangKC wrote: They really don't need to be adding much new retail space in that neighborhood anyway. There are plenty of older former retail buildings all around that block that just need to be remodeled. Actually, more retail can be a good thing. Bringing more space helps keep rent down and helps keep it from going up as demand in the area goes up with more customers. It encourages landlords to renovate, they can't ignore the quality of space if they're in horrible shape next door to right new. ADA compliance at a new space when the old next door is grandfathered doesn't make the old place look good. If they're all that exists why would the owner bother? Sometimes places need to look bad to be encouraged to renovate. It helps bring new amenities to the neighborhood. The required bike parking at a new infill project can be used for shops nearby too. A renovation may be grandfathered and not need to add bike parking. It's the network effect working to improve the entire area. So, are they to add retail space at a cost that very likely sits vacant for a significant period of time.